TALK Atlanta is a school that is remarkable for the huge diversity of nationalities and cultures that the school attracts. This has become a source of pride: in their testimonials, students talk constantly about the close ties that are formed with each another and how much they learn about other cultures. Two of our students who recently graduated from TALK Atlanta, Meiga Aulia Pupspita from Indonesia and Luisa Fernanda Reyes Bello of Colombia, wrote us a testimonial which certainly makes this point. Meiga Aulia Puspita came to the school from Indonesia. I got that opportunity to practice my English intensively yet have fun. During my study here, I feel that my speaking, listening and writing has improved a lot because every day we always have something to discuss which encourages us actively to use those three important abilities: speaking, listening and writing. Besides, Here I also made a lot of friends from different countries, and it’s so amazing to know about a different culture from them. Above all, the teachers and staff are really the best here: they’re so helpful and always nice to me. Thank you guys! 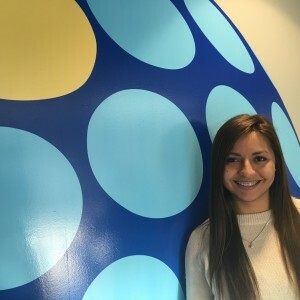 Like Meiga, our student from Colombia, Luisa Fernanda Reyes Bello, was not comfortable about her English skills on arrival at TALK Atlanta, but not only did she overcome that, she too loved the diversity of cultures and the feeling of belonging that TALK Atlanta provided her.